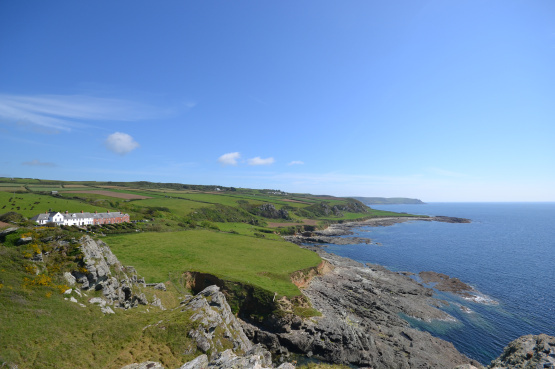 3 Coastguard Cottages is set in the most stunning location, overlooking the sea in an idyllic spot, where you can sit and be lulled by the soft sounds of the wind and waves and magnificent views. You could stroll down to your gate and access the South West Coast path and be at Horsley Cove within a few minutes’ walk. The cottage has a delightful feel, with stripped wooden flooring, cosy wood burning stoves in both reception rooms, neutral décor throughout and is arranged over 2 floors. Upstairs are 2 double bedrooms and 1 single with the master room making the most of those spectacular sea views. The kitchen flows into the dining room, with a fitted wood burner for those wintery nights. The south facing sitting room is at the front of the property again making the most of the amazing vista, this too is fitted with a wood burner. From the French doors there are steps down to a sheltered sunny patio area and onto a further lower garden from where you can access the coast path. To the rear of the property is a path leading to a courtyard area and a brick outbuilding, currently used as a garden store. 3 Coastguard Cottages is offered for sale at offers in excess of £450,000. For further information please contact Marchand Petit’s Kingsbridge office on 01548 857588, email: kingsbridge@marchandpetit.co.uk.